Until last December, it had been more than 30 years since the last time our tax code was reformed and the tax code had become unfair to many and burdensome to all. The Tax Cuts and Jobs Act addresses these problems and keeps more money in the pockets of hard-working Americans, who can make independent decisions about the use of their own money. Up until now, we talked about the possibilities of tax reform – now we can talk about the realities of tax reform. 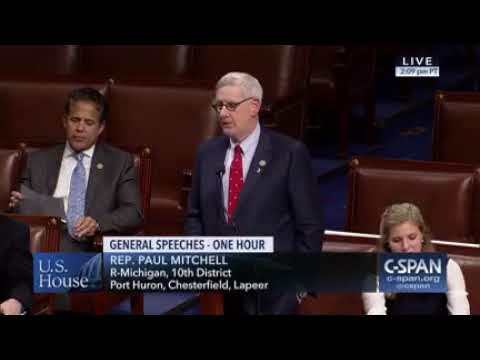 That’s why I recently led a group of members from the Michigan delegation in one hour of speeches on the House floor to share the benefits of Tax Cuts and Jobs Act in their home districts. Click here to find out more about what tax reform means for Michigan. Click here or above for a video explanation of the Protecting Our Children's Future Act. For too long, our government has struggled with short-term spending bills that are bad policy and bad politics. This is a direct result of Congress not having the adequate tools to budget and appropriate effectively. It’s time we fix our nation’s antiquated, broken budget process with a more effective system that requires accountability for how money is spent. That’s why my colleague Bradley Byrne (R-AL) and I introduced The Protecting Our Children’s Future Act, which will allow Congress to responsibly budget for the future and rein in out of control spending – one of the top reasons I ran for Congress. To read more about the bill, click here. The American workforce must be ready to meet our nation’s expanding infrastructure needs. During President Trump’s State of the Union Address, he stressed an overhaul of our nation’s aging infrastructure as a national priority, as well as the need to prepare Americans to fill the millions of jobs that will be created by a major rebuilding of our infrastructure. That’s why I introduced the Building U.S. Infrastructure by Leveraging Demands for Skills (BUILDS Act), which helps achieve this goal through partnerships that encourage transportation infrastructure industry growth, and improve worker training, placement, and retention. With a background in workforce development, I’ve seen how these programs can change someone’s life. It’s time to upgrade our nation’s infrastructure, close the skills gap, and get Americans back to work. To read more about the bill, click here. It is extremely important that all government data systems are safe and secure. That’s why I recently introduced a bipartisan bill, the STB Information Security Improvement Act, which requires the Surface Transportation Board (STB) to implement an information security plan that follows recommendations set out in a recent unfavorable Department of Transportation (DOT) oversight report.The STB is a federal, bipartisan board that provides economic regulatory oversight of railroads, intercity bus carriers, trucking companies, and more. According to the DOT report, the STB’s information security program was found “not effective,” increasing its “susceptibility to external threats and to non-compliance with Federal requirements and guidelines.” These vulnerabilities leave STB employees’ and railroad stakeholders’ personal information and work unsecured and vulnerable. I spent more than 30 years in business, and this level of vulnerability would have never been tolerated. My bill ensures the STB moves quickly to protect its digital infrastructure and all proprietary information submitted to it. To read more about the bill, click here. As a father of a child in grade school and also a law enforcement officer, I think of my own family as I reflect on the events that unfolded in Parkland, Florida. While no law can prevent all malicious individuals from committing such acts, we must evaluate how best to prevent such events. I am committed to this effort. Many have called for increased gun control measures and restrictions that drastically reform current federal, state, and local policies for gun possession. I understand this response, especially after such devastation, and I am open to an honest review of all contributing factors and reasonable measures to prevent gun violence and similar tragedies. It is also my duty to uphold the Constitution, including the Second Amendment, and it is important that I evaluate all legislative or administrative action with this foundation in mind. Last week, the House passed a bill I cosponsored, HR 4909 – STOP School Violence Act, which would provide money for schools to conduct threat assessments, train teachers, and stop shootings before they happen. To read more about the bill, click here. You should also know I supported a measure that, among other provisions, improves reporting to the National Instant Criminal Background Check System (NICS). The bill holds agencies accountable for reporting prohibited persons to the FBI and incentives and assists states with ensuring appropriate records are entered into the NICS system. This is an important step forward to enforce our existing laws. Each Spring, the Congressional Institute sponsors a nationwide high school visual art competition to recognize and encourage artistic talent in the nation and in each Congressional district. Since the competition began in 1982, more than 650,000 high school students have participated. The 2017 winner was Port Huron Northern High School student Andrea Dunn. Her piece, “Homecoming Portrait” is hanging in the Cannon Tunnel, the walkway that connects the House office buildings with the US Capitol. The Congressional Art Competition is open to all high school students in our district. The winning artwork of our district's competition will be displayed for one year in the U.S. Capitol. The exhibit in Washington will include the winning artwork from all participating districts from around the country. To participate, students must drop off their (1) piece of artwork and student release form, below, at the Shelby Township district office by 5:00 p.m. on Wednesday April 4, 2018. To learn more, click here.